A major figure in the precisionist movement, Charles Sheeler was born in 1883 in Philadelphia. He studied art from 1900 to 1906, first at the Pennsylvania School of Industrial Art, then under William Merritt Chase at the Pennsylvania Academy of the Fine Arts. Several trips to Europe between 1904 and 1909 heightened Sheeler’s awareness of European modernism, influencing his developing style. His artistic transformation occurred when he traveled to Italy and France in 1908-09. Upon his return to Philadelphia, Sheeler discarded the Chase-inspired spontaneous, bravura brushstrokes and began employing an underlying geometric structure reminiscent of early Italian Renaissance Masters he had seen, such as Piero della Francesca and Giotto, and of French modernists such as Cézanne, Braque, and Picasso. With the intent to establish order and permanence in his work, Sheeler smoothed his brushstroke, eliminating evidence of gesture and of execution. This approach was reinforced by his frequent visits to New York and his participation in the Armory Show (1913), the Forum Exhibition (1916), and the Society of Independent Artist’s Exhibition (1917), events through which he came in contact with modernists such as Marcel Duchamp, who played an important role in Sheeler’s understanding of the essential structure of forms. In 1912, Sheeler had also ventured into commercial photography, focusing on architectural subjects and eventually becoming acquainted with New York avant-garde artists and collectors. His pioneering photographs, using sharp-focus effects, were also instrumental in transforming his paintings into detailed and smooth-surfaced images that reject his earlier loosely brushed style. After Sheeler moved to New York in 1919, he dedicated himself to clarity and order, imposing these ideas on a subject that was rapidly becoming an American icon: the skyscraper. Like the Pennsylvania barn, a theme he had explored in 1917 and 1918, the skyscraper was an architectural subject through which the artist could capture the streamlined grandeur of New York. The geometry of the buildings lent itself ideally to the creation of abstract designs on canvas. As he developed his signature precisionist style, Sheeler’s simplified cubist compositions became more detailed, photograph-like images with sharp edges, dramatic light and shadow, and striking perspectives. A solo exhibition at a New York gallery in 1922 defined Sheeler as a central proponent of Precisionism. Commissions to photograph the Ford Motor Company’s plant at River Rouge, Michigan (1927-28), brought him international acclaim, as he presented a pristine view of American industry. During the 1930s, Sheeler focused his attention on painting, further developing a style based on strong geometric order for subjects of American industrial life. A retrospective at The Museum of Modern Art in 1939 was testimony to his growing success and critical acclaim. 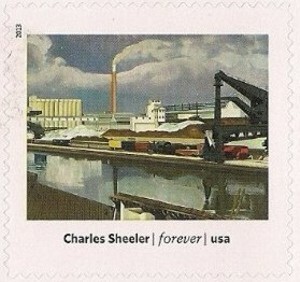 Sheeler continued to live and work in New York until his death in 1965.